Brimham Rocks are a collection of natural rock formations created by a large river that ran through the area 100 million years before the first dinosaurs walked the earth. As you explore the rocks you really feel like you are taking a step back in time. It like something from another world. We had picked a good day as the weather was warm but overcast. Not a black cloud in sight. But a little muggy. For us to get to Brimham Rocks it was a straight run on the A1 (M) then off at Ripon. We are fortunate to live just an hour away from such a natural wonder. It was busy when we arrived, but we managed to get a parking space pretty sharpish. Before we actually went into the National Trust Park, we spent our time eating our picnic that I had packed. It only costs £6 to park at Brimham Rocks, and then you are FREE to enter and explore the area. At Brimham Rocks there is a visitors centre, kiosk and a shop selling local produce or you can take a picnic and just enjoy being outdoors. 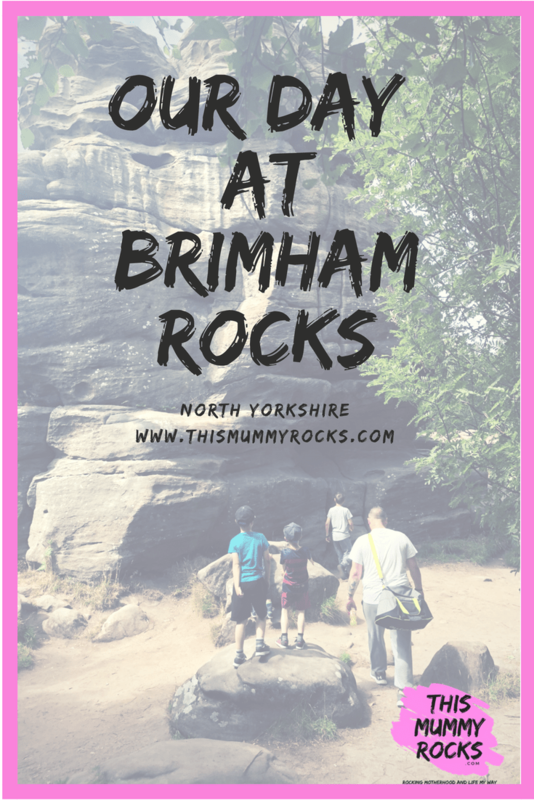 The reason I picked Brimham Rocks was because I knew that my boys love the outdoors and they need to space to move and explore. Having 2 sons with Sensory Processing Disorder, they need a lot movement and ways to burn off excess energy. Being outside amongst nature is perfect! The area of Brimham Rocks is huge, with a great array of natural rock formations that looked like the UK’s own version of the Rocky Mountains in the US. I can honestly say we all enjoyed climbing the rock formations. My boys made up little adventures as we went from formation to formation. Not only did we get to enjoy the rocks, but there are some breathtaking views over North Yorkshire too. Especially if you climb high enough! I have to admit North Yorkshire is one of my favourite places in the UK to visit! Brimham Rocks is a National Trust area. The National Trust work hard to protect the landscape and nature that exists there. We got talking to some of the very helpful National Trust Rangers, who introduced us to the National Trust Membership scheme. To my surprise, it was £120 for a years Family Membership! They even had the option for a £10 monthly direct debit payment. £10 for the whole family to be able to access National Trust sites for FREE! You guessed it, we signed up there and then! You can only imagine how much it costs for a family of 7 to go on a day out! This has opened up a whole new world of adventures and days out for us. I can definately say that Brimham Rocks has become a firm favourite on our lists of days out! Have you ever been to Brimham Rocks? I’d love to hear your experience. oh wow this place looks amazing!! The child in me just wants to try and climb this!